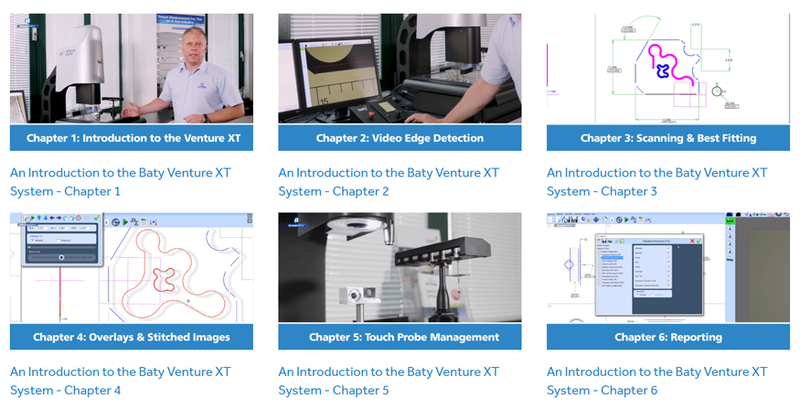 Training Videos on the Baty Venture XT Now Available! Bowers Group has released an impressive selection of instructional training videos with valuable information about getting the best results from the Baty Venture XT Vision System. There are 6 videos in the series, with each detailing an important part of the Venture XT’s use. Featuring Geoff Jackson, Business and Product Development Director at Baty the videos explain the features of the Venture XT; a sophisticated vision system that truly paves the way for high accuracy contact and non-contact measurement. The newly styled vision system includes an extended 200mm measuring range in the Z axis, new column design with integral Z axis counter balance, faster X-Y axis drives, touch screen, greater field of view and magnification up to 12 x zoom. The enhancements to this new product also include a major redesign of the software. Download the latest Baty Vision System Brochure - including the Baty Vumaster, Venture Touch, Venture Plus and the new Venture XT.